O gentleness! O beauty so simple and real! Goddess, for whom the cult means reason and wisdom, for whom the shrine is an eternal study in conscience and sincerity, belated I arrive at the threshold of your mysteries. There is no salvation for the world, unless it returns to you. - Ernest Renan. Before 480 BC and at the same place the Parthenon is at now, one had started building a temple, the Proparthenon. It was the first big marble temple in Athens, equal in size to the present Parthenon. This temple was destroyed when the Persians took possession of the Acropolis in 480 BC. Later, parts of this temple were used in the wall of Kimon. Under Pericles and on top of the fundaments of the previous temple, the Tempe of Athena Parthenos was erected and finished between 447 and 432 BC. The architects of this temple, a masterpiece in Greek building art, were Iktinos en Kallikatres. Pheidias, a friend of Pericles, had the overall supervision of the construction works on the Acropolis. In the 6th century AD. the Parthenon became a Christian church, with the addition of an apse at the east end. It next served as a mosque and a minaret was added to it. In 1687, in the Venetian attack on Athens, it was used as a powder warehouse by the Turks and the entire center portion was destroyed by an explosion. The Parthenon is built with Pentelic marble. It is a Doric temple with Ionic elements. At the east and west facades there are two Doric galleries with six columns. The building is surrounded by a Doric gallery with 8 columns at the short and 17 at the long side. - the columns become smaller to the top en bend towards the middle of the temple. - the corner columns have a larger diameter then the other columns. This way the deviation the human eye creates was corrected. The outside Doric frieze had 92 metopes with figures in relief. On the east side the Gigantomachia or battle with the giants was depicted and on the west side the Amazonomachia or battle with the Amazons. The south side had the Kentauromachia (battle with the centaurs) and the north side showed the capture of Troje. The metopes that survived time are kept in the British Museum, the Louvre, the Acropolis Museum and on the temple itself. The east pediment showed the birth of Athena from the head of her father Zeus and on the west pediment the battle between Poseidon and Athena was illustrated. The roof of the temple had akrotiria (kind of roof statues) in the form of twined plants. The frieze of the Parthenon has 360 human figures in total as well as a big number of animals. All move towards the east where the handing over of the peplos takes place in the presence of the Gods and the most important people of the town. In this great composition all acquisitions of the Athenian democracy are melted together. The cella of the Parthenon is 30 meters long (98,4ft) and is exceptionally wide. Usually the inner room was not big as there were no religious services held. They were held on altars in the open air. The Parthenon was the first exception even though services outside were also continued. There was another reason for the inner room to be this large. 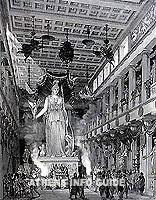 The giant 12 meters (39,4ft) tall statue of Athena Parthenos, made of ivory and gold, had to be put in the cella. Pheidias, the artist, had made the statue of the goddess bearing full armor holding a small Nike in one of her hands. The pedestal showed the mythological scene of the birth of Pandora. In front of the statue there was a basin with water. It was there to humidify the ivory and keep it in good shape. The reflection in the water also gave the statue dignity. The statue of Athena Parthenos was surrounded with a two-story column gallery in the form of a Greek character . The west part of the Parthenon, closed off by a slant wall, was used as treasure room for sacred objects. The inner room had four Ionic columns in two rows. The Ionic frieze that circled the temple on the inside, was right under the ceiling. This 160 meters (525ft) masterwork of Pheidias showed the most important manifestation of the worship of the goddess Athena, the Panathenaic procession. The big Panathenaic games were held every four years in the honor of Athena Polias. During this festival that went on for a week, musical and athletic competitions took place. The highlight of the festival was the Panathenaic procession which ended in the symbolic offer of a new peplos to the wooden statue of Athena Polias in the Erechtheion. The peplos would show embroided scenes of the battle of the giants and it was transported on a wagon in the form of a ship on wheels. The procession started from the Pompeion in Kerameikos, crossed through the Agora, followed the Panathenaic road to end at the holy rock. The offering of the peplos would be followed by an offer of about hundred animals and a meal for all the citizens .